Improve your digital art game with these deals on Wacom Cintiq displays. Today's the day eagle-eyed shoppers have been waiting for: Black Friday! As we're sure you're aware, this is the day you can pick up unbelievable bargains on a range of creative and design products. 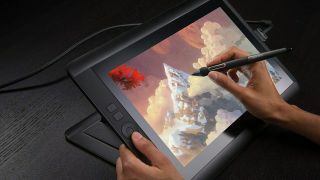 We've already curated the best offers you need to know about on our Black Friday deals page, but we thought these Wacom Cintiq discounts deserved extra special attention. As any digital artist will tell you, working with a mouse just doesn't cut it when it comes to creating images on a device. That's where Wacom Cintiq tablets come in. Thanks to their incredibly sensitive pens and displays, Wacom Cintiq devices are able to replicate the feel of using traditional tools. Once it's out of the box and calibrated, Wacom Cintiq pen displays deliver a high-performance digital drawing experience. Complete with high-resolution LED displays that can render millions of colours, your imagination's the limit when it comes to whipping up a masterpiece on these tablets. What's more, each one comes supplied with its own pen so you can start working right away. Shoppers in both the US and UK can pick up juicy discounts on Cintiq pen displays right now. With $200/£200 sliced off each tablet, these appealing tools just got even more attractive. Check out their specifications with our deal links below. Save: £200: Perfect for aspiring and established artists, this Wacom Cintiq display is capable of realising 16.7 million colours on its HD 1,080 LED display. Save: $200: This is one of the biggest Wacom deals we've seen this Black Friday. With a whopping $200 slashed off its rrp, this incredible device just got better.